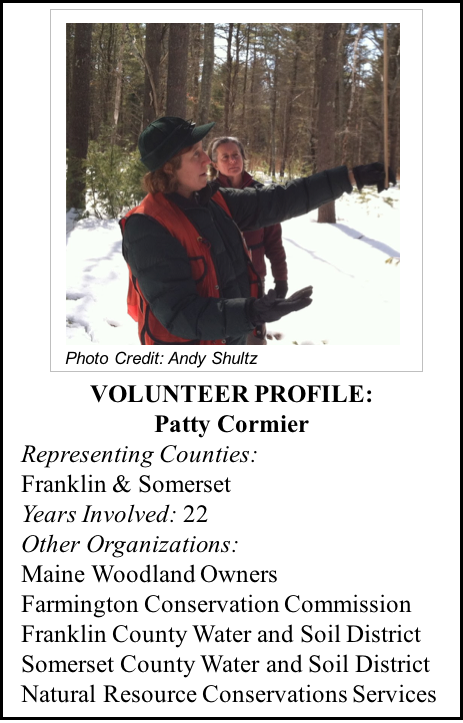 Patty Cormier has been on the Maine Tree Farm Committee since 1998. For the past 20 years, she has served as the Somerset County Chair and since 2002 has been the program’s Secretary. Over that time, she has been the rock of the program; her participation provides a continuous source of knowledge and consistency as things change over time. Her advice is especially key when planning the Annual Forestry Field Day, as she remembers all the things that have gone right and wrong over the years. Recently she has started attending the National Leadership Conference, developing her leadership skills even further, and sharing them with the other program volunteers. Patty is a District Forester for the Maine Forest Service, based in Norridgewock, and participates in other woods related programs including Maine Woodland Owners (Upper Kennebec chapter representative), Cooperative Extension, the Farmington Conservation Commission, and the Franklin County and Somerset County Soil and Water Districts.